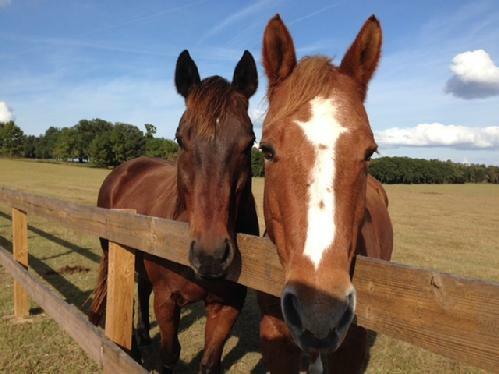 Mill Creek Farm is a blessing for old horses, abused horses and the people that love them. The Retirement Home for Horses gives lifetime care to horses that have special needs. Horse people are generally very loving folks. I have a daughter and a friend who are "horse people". If reincarnation really exists, coming back as a horse owned by one of these women would be a blessing. The horses who live at this farm include abused animals seized by law enforcement people, and horses rescued by the SPCA or Humane Societies. There are also old horses retired from government service such as police mounted patrol, parks, horses used by handicapped riding programs and circus horses. They don't accept horses from private owners, hoping that these horses are already provided for. 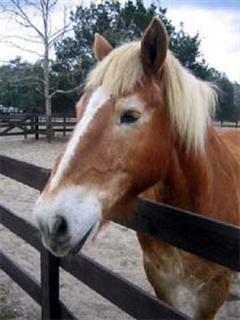 Horse retirement is not a subject that most of us spend much time thinking about. Lucky for old horses, that is not true for all people. Mary and Peter Gregory created this safe sanctuary for old and abused horses in 1984. Mill Creek Farm has more than two hundred of acres of peaceful rolling pastures allowing horses to wander around at will. There are also plenty of trees on the farm that offer shade to the horses. These horses are retired, and will never work or be ridden again. They live the rest of their lives in peace and dignity. There are now more than 100 horses at the farm. These animals receive loving individual attention with feeding, grooming and veterinary care. You may get a chance to meet Duke, a blind Appaloosa. He has fallen in love with Maggie Mae, a blind Mustang who also lives on the farm. Or maybe you will run into Clariant, a Tennessee Walker, who is happily retired from the City of Gainesville Mounted Police Unit. The Retirement Home For Horses, Inc. is a not-for-profit organization. They rely on the contributions of horse-loving individuals. Even though admission for visitors is very reasonable - two carrots - I'm sure they'd welcome your check as well. The fee to visit Mill Creek is the most reasonable of all Florida tourist attractions. Two Carrots. No kidding. Open on Saturdays only from 11:00 am to 3:00 pm. Alachua is in North Central Florida, just a few miles north of Gainesville, home of the University of Florida. Take I-75 to Exit 399. Travel west on US 441 to County Road 235A (immediately after Santa Fe High School). Turn right at red light onto 235A. Travel about 3 miles to the farm sign. The sign is on your right, just beyond the I-75 overpass. Turn right, follow the driveway and park under the trees near the picnic tables. 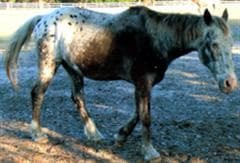 Since you probably came to this web page because you are a horse lover, you will enjoy this University of Florida article about The Florida Cracker Horse.